When discussing the greatest men to ever fight out of the island of Puerto Rico, the typical names that get brought to the table are Carlos Ortiz, Wilfredo Gómez, Wilfred Benítez, Héctor Camacho, Edwin Rosario, Wilfredo Vázquez, Félix Trinidad, and Miguel Cotto. However, one name tends to get overlooked and seldom mentioned. Ironically, it’s the smallest man out of all the accomplished Puerto Rican fighter’s that gets overlooked. Even though he was the smallest, he was, in my personal opinion, the purest boxer of them all. This man contained an enormous amount of skill in such a small frame. Despite his size, he measures up to all the other great Puerto Ricans that have graced the ring. When looking at the 105lb picture, he is widely considered the second greatest strawweight of all-time. This man is “El Niño de Hierro” (Iron Boy), Iván Calderón Marrero (35-3-1). Calderón was a bronze medalist in the 1999 Pan-American Games as a light flyweight. His amateur background is very respectable, including wins over four-time, two-division world champion Brian Viloria and even one over future first ballot hall of famer, Miguel Cotto. Calderón emerged on the professional scene on February 17th 2001 with a first round stoppage victory over Sergio Diaz, it would be one of Calderón’s six knockout wins during his career. Calderón wasn’t a fighter that packed anything devastating in his arsenal of punches, but he made up for that with his swift feet, elusiveness, awareness, ring generalship, and timing. He was a complete boxer, minus the power. 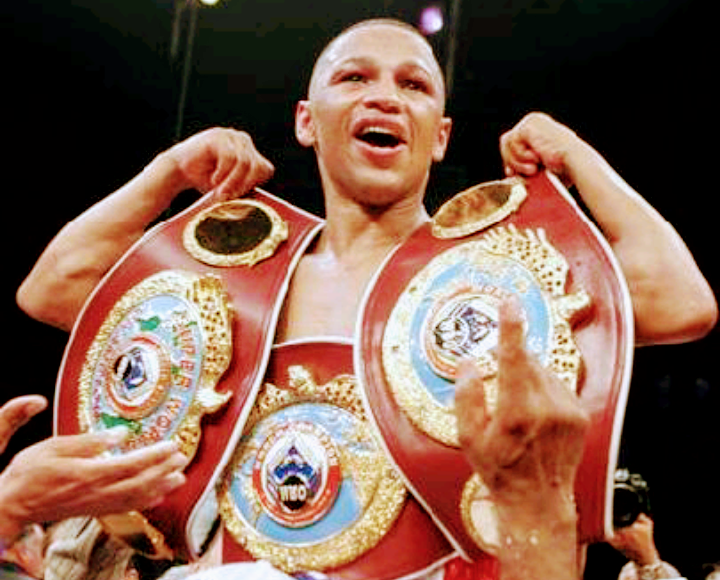 All of these attributes aided him in becoming WBO Strawweight Champion in just his fifteenth professional fight on May 3rd 2003, capturing the title from Eduardo Ray Marquez. Calderón would go on to make one of the most dominating championship runs in boxing’s history of little men. In his four-year reign as the best 105lber on the planet, he strung together eleven (11) consecutive defenses, with legacy defining victories over world champions, Alex Sanchez, Roberto Carlos Leyva, Daniel Reyes, and Isaac Bustos. On August 25th 2007, Calderón moved up three pounds in weight to the light flyweight division to take on WBO & Lineal Champion, Hugo Fidel Cazares. In a close bout in which Calderón had to overcome adversity after being hurt several times, he dug down deep and mixed it up with Cazares while incorporating superior movement to get him the split decision victory. Calderón’s win over Cazares made him the man who beat the man at 108lbs as well as a two-division world champion. Calderón would hold on to his WBO Light Flyweight Title and Lineal Crown for three years successfully defending it six consecutive times. He’d go on to add more world champions to his resume with wins over Nelson Dieppa, Hugo Fidel-Cazares in a rematch, and Rodel Mayol. While successfully defending his world title seventeen consecutive times from strawweight to light flyweight, Calderón defeated a total of seven world champions. A feat that is very impressive especially for smaller weight class standards. But many great champions hang around the sport longer than they need to, and they come across a much younger and hungrier fighter in their prime. On August 28th, 2010, Calderón would lose his pound for pound status after succumbing to his first loss at the hands of WBA Light Flyweight Champion, Giovani Segura. Calderón seeked redemption against Segura in a rematch nearly eight months later, but would be viciously knocked out in the third round. Calderón’s days at the top of the Boxing Mountain were over and it was apparent to everyone except him, unfortunately. He would move back down to 105 pounds and taste victory one last time on October 29th, 2011 against Felipe Rivas, to become the mandatory challenger for the WBO Strawweight Championship. However, this wasn’t the Iron Boy anymore. He was just a shell of his former self and that was evident when a full year passed before facing WBO Champion Moises Fuentes on October 6th 2012. Calderón would hang up the gloves for good and retire after this defeat. Those over the hill defeats did not diminish his legacy whatsoever. The dominance he displayed from 105 to 108 will most likely not be replicated anytime soon if ever. He gave two unknown weight classes a spotlight and did so with a pure technical style. There will probably never be another fighter in that weight range as skilled, crafty, or as daring as him again. Look for the man to be in the International Boxing Hall of Fame someday as 2017 was his first year of eligibility. He most definitely deserves it.